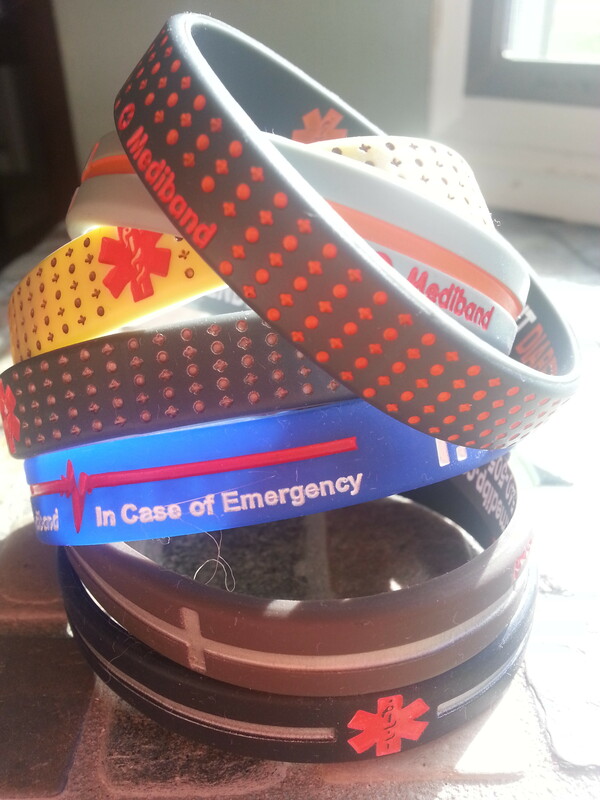 Several months ago I wrote I Heart Silicone Medical ID Bracelets ♥ , covering the list of reasons why I wear a medical ID bracelet and choose to go silicone (on the wrist!). Also, I plugged my favorite place to order individual bracelets with customizable text (inside and outside.) 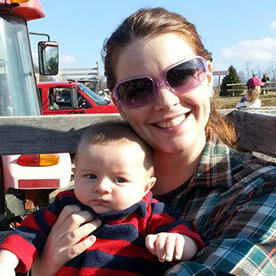 Today, I’m plugging a newly discovered favorite, Mediband! While, I do still love my old silicone bracelet, 4 years is a long time to wear the same one…and I think our relationship was due for a little “space,” so I’ve been on the lookout for new diabetes wrist bling. Criteria: Silicone, customizable inside/outside, and hopefully something with a little character that isn’t too child-like. I’ve also have been considering finding a place online to store all my medication/dosing info…and it turns out Mediband fits the bill there as well. Previously, I had all this information at home and in an emergency my husband would probably be able to find it. However, with everything else in my life stored and easily accessible “on the cloud,” why not this too? Why burden my husband with having to know where to look for it? I found myself biting the bullet and looking into MedicAlert. For some reason, that company has always made me feel like it caters to a much “older” crowd and with my 40th birthday looming on the horizon, I wasn’t excited about it. It does seem that their website has been “youthed” up a bit, however I still find a lot of their jewelry personally unappealing and their service isn’t free, at $10-$50/year. Plus, a lot of their jewelry has “set engraving” which means it’s not customizable. 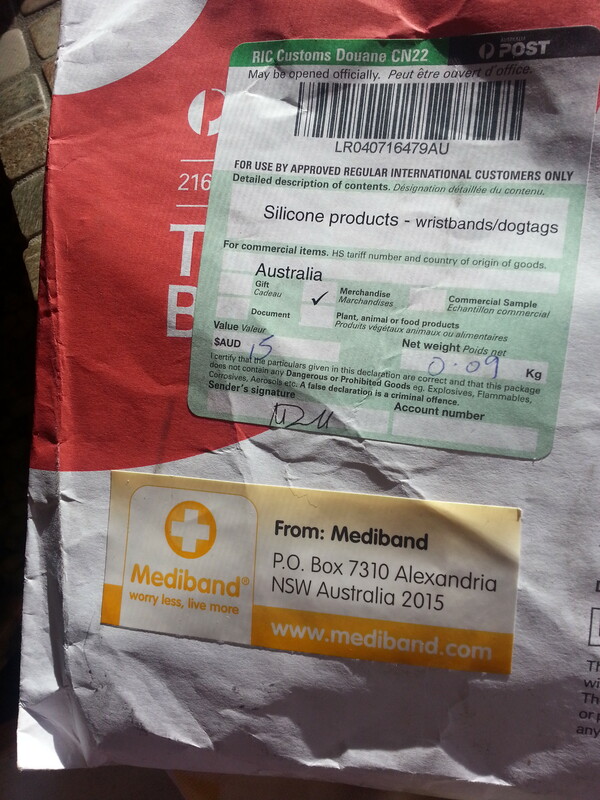 Mediband (based in Australia,) on the other hand, has an online Emergency Medical Information Record (EMIR) called MedibandPlus that is free for the first year with a purchase of a bracelet and only $7 a year after that. You can enter only what you like and set the privacy level individually for each field of information, e.g. Maybe I don’t care if everyone in the world could see that I’m Type 1 diabetic but would prefer to have only hospitals be able to access my health insurance ID. Of course, to access any of your information, someone would first need to enter your membership number on the MedibandPlus website…and mine is safely tucked away on the inside of my wristbands. For the wristbands themselves, I wanted to order the customizable set of 7, but seeing as they were coming all the way from Australia, there were 7 of them, and I’d be wearing one everyday, I wanted to be sure I got the order right. I emailed with my detail oriented (hopefully not to annoying) questions about exactly what the finished product would look like. Their customer service was great (and patient with me)! I took the plunge and then waited almost a month (custom product from Australia, remember), which actually felt like a year, and finally got them last month! I love them! In fact, I like the look of them so much, I often “go eighties” and wear several at a time. I’ve even gotten compliments on them from non PWDs who just think they look cool. I chose to have the “Star of Life” logo in bright orange/red on the outside, so it wouldn’t be likely to be missed in an emergency. I also printed “Insulin Dependent Diabetic” on the inside with another logo (where the logo and Diabetic are in bright orange.) Then, there is still room for me to add my MedibandPlus membership ID, the website url, and my husbands name and phone number. For me, on all fronts, Mediband is a win. Like most of us, some things “diabetes” I’m good at and some…not so good. An area I usually excel in is being a “good girl” and wearing a type 1 medical ID bracelet. I’m not the kind of person that wears a lot of jewelry on a regular basis, nevertheless, when I first started wearing a diabetes ID, I tried out a few different kinds of bracelets. Most of them were very jewelry-like, lasted a day or two, and now sit in a drawer collecting dust. Once I discovered the ease and beauty of simply wearing a piece of silicone, I never went back to the other “prettier” bracelets. Silicone works for me because I don’t have to worry about getting it wet or getting food on it when I’m cooking; the kids can pull on it and play with it; I can shower, sleep, swim, play sports, and generally be active all while comfortably wearing it…and it still looks like it did on the day I started abusing it 4 years ago. While I can’t control when or if an emergency situation might occur, I can try to have important info on hand (pun intended). So, if I’m going to wear the darn thing every day (in case of an emergency), I don’t just want it to say “Type 1 Diabetic” on it. I want it to at least list general medical information and my husbands phone number. I really like the idea of providing a phone number of someone who knows what medications and dosages I’m on, who knows my kids and their schedules. I find it comforting. Geez, how can I fit all that information on a wristband? I found a lot of bracelets that have tiny little pieces of papers or cards in them that you’re supposed to be able to neatly fill out with personal information. Sorry, but my handwriting is not that good (or that small). Plus, it’s paper…what kind of life expectancy can that little slip of paper have with stinky toddler fingers, days at the pool, and sinks full of dirty dishes? I’ve researched endlessly online to find a company that will let me add multiple lines of custom text to a silicone bracelet (without requiring a minimum order of 50!). Here is my favorite: Design-A-Band. OK, admittedly, their site might seem a little hokey but I’ve ordered various bracelets from these guys over the years and they’re always spot-on! And…drum role please…here’s my current favorite wristband: tried but true, worn day in and day out for 4 years, and glow-in-the-dark. On the outside I have some basic info that the whole world can see and on the inside, I have personal medical information and contact phone numbers. Got one you really like? Tell us about it!